Entries tagged with “Enter to win”. Good luck – I look forward to hearing about your favorites. I’ve heard that real estate agents recommend baking a cake or a batch of cookies just before an open house. The hope is that the sweet smell emanating from the oven will beckon to prospective buyers. When we shopped for our place, we saw something like 40 houses in four days, so I can’t tell you with any certainty whether any of them smelled like cookies. There was one place in Marina del Rey that smelled like old soup, and several new condos that offered the seductive chemical high of new carpet fumes, but there are none that sing out in my mind as That Place That Smelled Like A Big Fat Cake. I would have remembered roasting garlic. My allegiance to baked goods notwithstanding, if I were to select one aroma to illustrate the olfactory concept of Home, it would be the smell of garlic roasting in a hot oven. 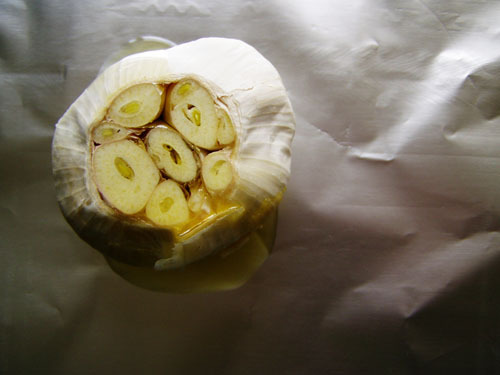 As it roasts, garlic softens, both in texture and intensity. It abandons the militant aggression it so favors when raw and matures into something warmer, friendlier, with a softer smile. 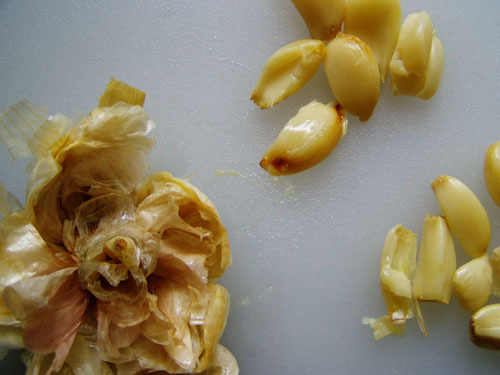 If raw garlic is an outspoken 19-year-old, defiantly braless and passionately committed to a new cause biweekly, then roasted garlic is the 45-year-old that kid grows up to be, who reads edgy historical fiction, drinks more green tea than coffee, and always listens patiently. When I cook with garlic, I breathe a contented sigh every time I reenter the kitchen. The scent surrounds me, offering a time-worn flannel shirt for the nose. It reaches in and puts me at ease; even the overhead Ikea tracklights seem fuller and more golden. A simple batch of aigo bouido – a garlic soup from Mastering the Art of French Cooking – simmering on the stove sets guests’ faces aglow as they enter for dinner. 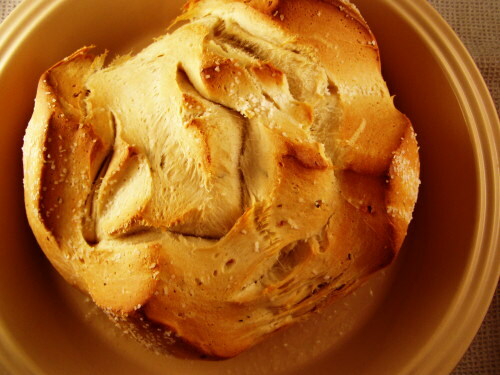 Graceful billows of garlicky steam tempt them to the table. 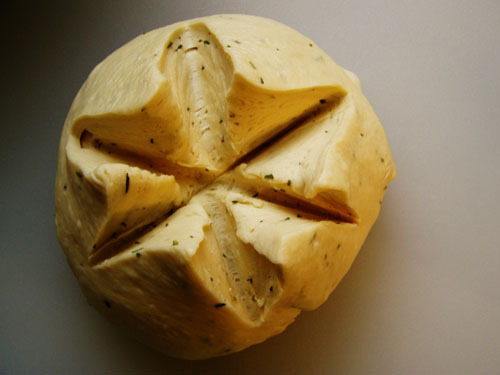 And a loaf of bread made with a rosemary garlic paste beams as it bakes, filling the whole house with herbed wizardry. Almost enough to sell the place. The Salty Spoon is powered by	WordPress 2.7 and delivered to you in 0.177 seconds using 23 queries.